Code Red" and having 15 seconds to run for cover. Imagine never being able to walk beyond sprinting distance of the nearest shelter. Can you imagine the fear and terror of a rocket whistling down, not knowing whether it will land a mile away or directly on your head? Or the sudden shock when you feel the impact and the sense the relief that you're still alive but the fear that your friends and family may not be so lucky. 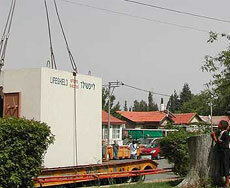 Operation Lifeshield was born out of an immediate and dire need to protect Israeli citizens from missile attacks. A non-profit organization that builds transportable shelters and deploys them in vulnerable Israeli communities, Operation Lifeshield is supported by people from all over the world who care deeply about the people of Israel. Portable shelters known as "Lifeshields" can be moved to where they are needed most, providing some solution to the lack of adequate underground shelters by offering both physical and psychological cover. "The main idea is to have them spread out in places where people are caught out in the open. They are designed to save lives where there is no shelter", said Josh Adler, co-founder of Operation Lifeshield. These state-of-the-art, free standing, portable, above ground shelters provide safety for Israeli citizens as they go about their daily lives. 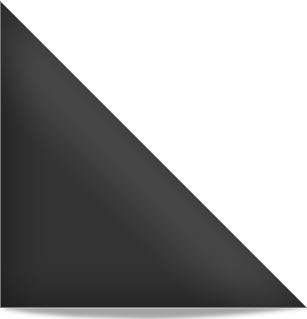 They are built to prevent the penetration of bullets, shrapnel and missile fragments and can withstand direct hits. While building underground shelters can take months, these pre-form units take only a few weeks to build and can be delivered and deployed immediately. "We needed something that could be done quickly and efficiently - that could be built in a factory and brought on a crane very quickly", said Adler. 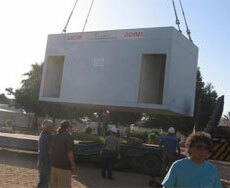 Although these shelters cannot provide Israeli communities with peace, they can provide both safety and peace of mind. 'Rockets into Roses' is committing to building shelters to protect the citizens of Israel. A portion of the proceeds of each item sold will be donated to Operation Lifeshield to build bomb shelters in the city of Ashkelon. The city of Ashkelon and Yaron Bob are most grateful for your support. And please refer all your friends, family and associates to our site. We would appreciate your help in spreading this powerful life changing message of Rockets into Roses around the world. 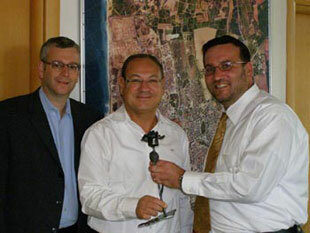 Michael Gerbitz and Chaim Pinsky with Danny Vaknin, the mayor of Ashkelon, presenting him with a rose to kick off the project. While the city of Sderot has been turned into a virtual fortress, with shelters in place everywhere you turn, Ashkelon is an open target with very few shelters to protect its' residents. "The city of Ashkelon is appreciative of 'Rockets into Roses' contributions to Operation Lifeshield. These funds are crucial to build shelters and protect the citizens of Ashkelon", said mayor Benny Vaknin. Everyone's hope is that there will be no more rockets or roses. But until then we need to build shelters to protect Israelis from future attacks. Mayor Vaknin added that 'Rockets into Roses' "plays an important role in sending a clear message of peace and hope."